Today I'm gonna talk to you about how to create a good pop-up for Website. actually used to be really against pop-ups. but then after I saw the power of them and after I increased conversions on our own website over 30 percent as a result of using them and really use pop-ups to monetize our blog to drive a lot more leads and then we rolled that service out to a whole bunch of clients some over a year ago. I got really into it I know a ton about pop-ups I actually really liked them but only if you use them in the correct way. and that is what I'm going to talk to you about today. sign up for a webinar anything you want. 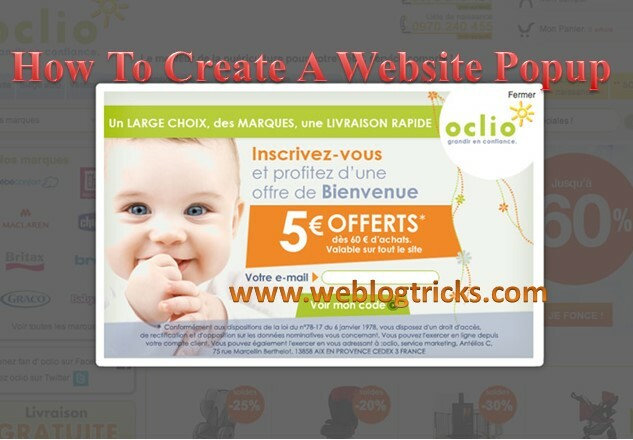 there's a lot of different ways that you can introduce to pop up on the weblog. you can set it so that it fires after a certain amount of time. So you have time duration it can be one second, two seconds, ten seconds I usually like to fire the pop-ups based off of the time of the site, on how much people take spend time on your website, and you can get that data from Google Analytics. of the percentage of the page that they've scrolled down, you can have it come in from a variety of different areas lower on the page, side of the page, top of the page. There are full-page takeover pop-ups there are pop-ups that show up at the top a bar pop-up you name it. there are options for how you want to deliver the pop-up. people usually get pretty upset, if you have a smaller pop-up that comes in after a couple seconds and it's not super evasive, you'll generally see that people read that, and then if you have the scroll down pop-up that comes up from the bottom after somebody's scroll down the page a certain percent that generally doesn't really annoy people too much at all. Every website has different segments.you've got different segments of your website. you have different pages of your website, certain pages are more popular than others. each page each your website has a specific intent you created that page for a reason. a lot of people do is they make the mistake of creating a general pop-up that they just fire on all of their pages when that's the case you're usually only going to see a click-through rate or an email entry rate on those pop-ups between you know half a percent and maybe two percent or something like that. I've done that before but really the best way to do it is to look at your top landing pages and look at that report and then create pop-ups by individual landing page, that are specific to the goal that you want to accomplish on that page. let's take that a step further, do you want to have a goal that's a hard goal meaning hard will or a macro goal like asking them for a lead or do you want to maybe fire a pop-up and then push them into something that's a little bit more subtle. like a quiz that you've created or just ask for their email address, these are things you want to think about because the percentage of interaction that you have there is going to be a direct result of the ask and how much the ask kind of impacts the user and takes them out of their current environment. another thing that's interesting about pop-ups is you can detect how the user came in, and fire pop-ups as a result of that, you can fire pop-ups to people that come in from Google, from people that come in from Facebook, from people that come in from Bing. so think how cool and integrated that gets and think how much time you can spend on it but that level of sophistication is what makes your interaction rate on the pop-up go from half a percent to 10,20 percent and really increase those leads so it's exciting stuff and think about those own those implications for your own business. to each piece of creative so always run tests never just run one I've always got a test going and we picked the winner and then we refine that and that's allowed us to maximize conversion significantly for clients and for ourselves.